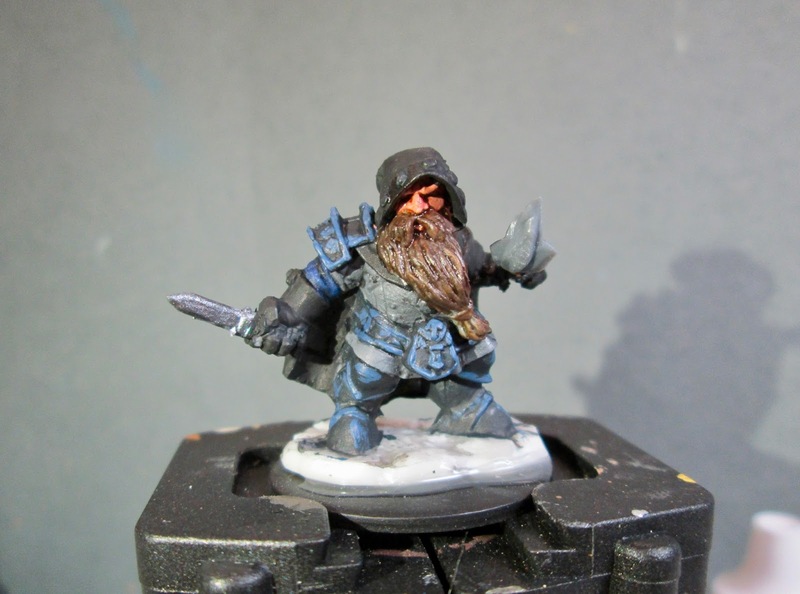 Durok, Dwarf Ranger: Bones 3 Figure, Converted to Frostgrave Thief | H.A.W.K.S. 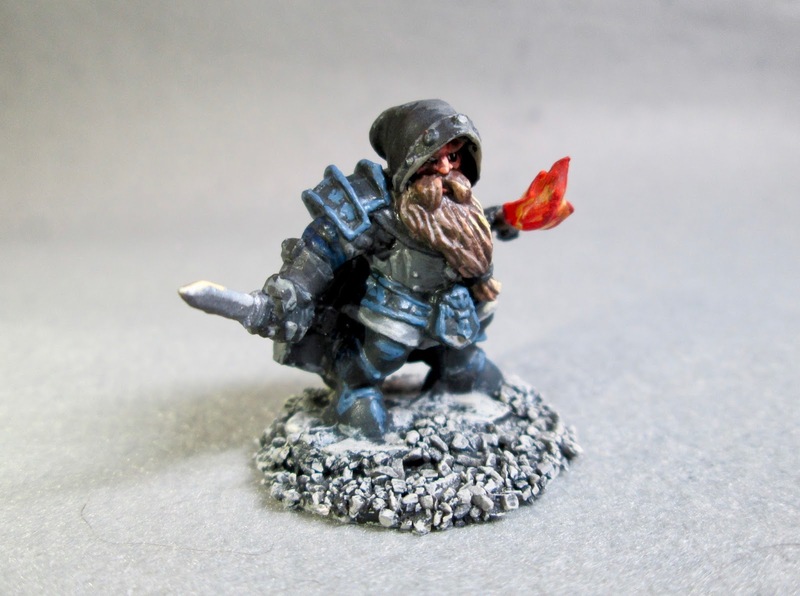 This past week I returned to working on my Frostgrave Dwarf conversions, and painted Durok, Dwarf Ranger; who I had earlier converted to a Thief for my warband, by using a dagger and torch from the Frostgrave plastic Soldiers Set. This week, I am working on the figure on the left. 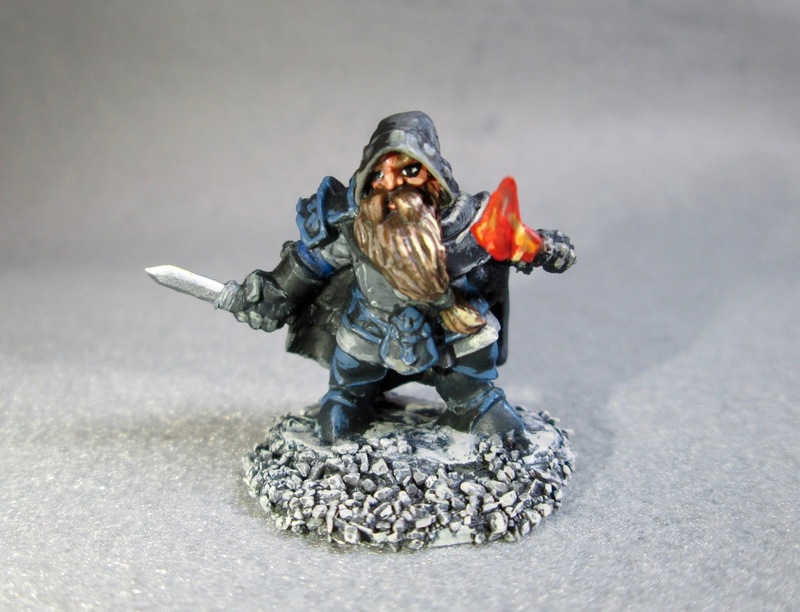 Here he can be seen with his original weapon removed and a dagger and torch added. I forgot to take a starting photo, but you can see what he looked like in the bare Bones, so to speak, on the left in the photo above. I had of course prepped this figure in the usual way; soaking it in a dish of water with a couple drops of dish-soap added, and giving it a light scrub with a soft toothbrush, and then rinsing and drying it, back before I did the conversion work. After the conversion work, I glued the figure to a black-primed 1" fender washers with Aleene’s Tacky glue. When dry, I put it in my painting grip. 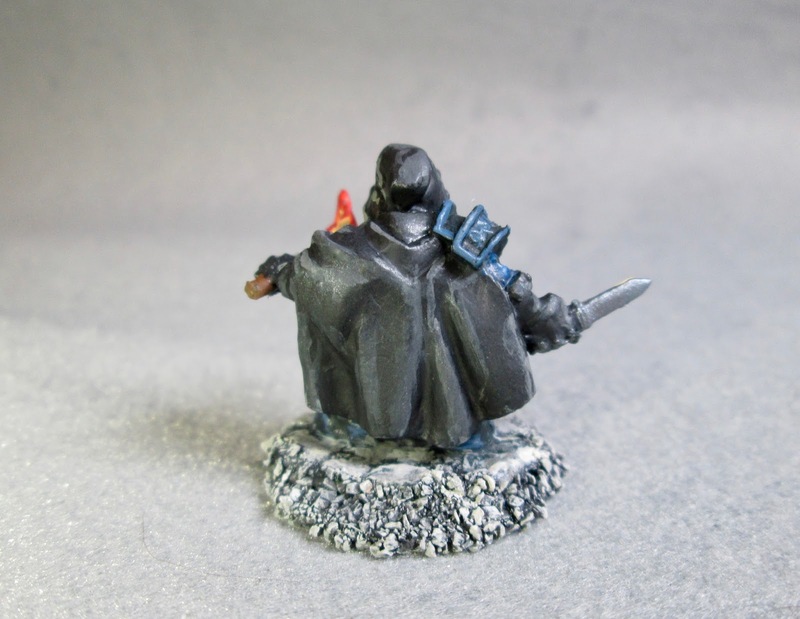 I began by giving the figure a thinned wash of Reaper MSP “Grey Liner”. When the wash was dry, I painted his face with Americana “Shading Flesh”. This figure is pretty much decked out in a lot of armor, but I thought I’d try to paint it so it either looked like cloth or leather armor; to help sell the idea he was a thief. So, I painted his “tunic” with Americana “Zinc”, and then painted his cape, hood, and gloves with Ceramcoat “Black”. I let everything dry a bit, and then I gave his face a wash with some Citadel “Reikland Fleshshade” wash. When that was dry, I gave his beard a wash with Citadel Agrax Earthshade"wash; and when that dried, I gave his tunic a wash with Citadel “Nuln Oil” wash. After that, I did highlights on his boots, belt, pouch and shoulder armor with Citadel ‘The Fang", and I painted the knife blade with Folk Art Metallics “Gunmetal Grey”. I then painted his eyes and highlighted his face. 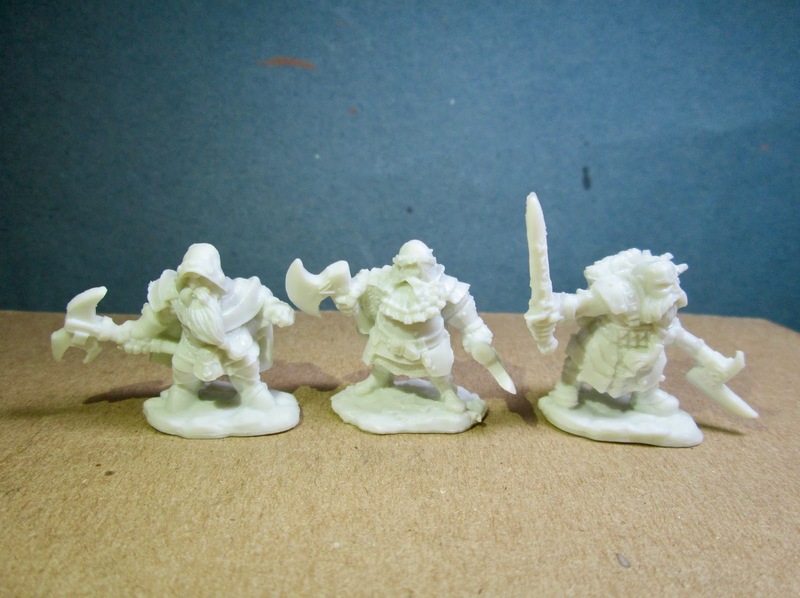 I only applied the highlights to the right side, to help with the OSL (Object Source Lighting) effect. 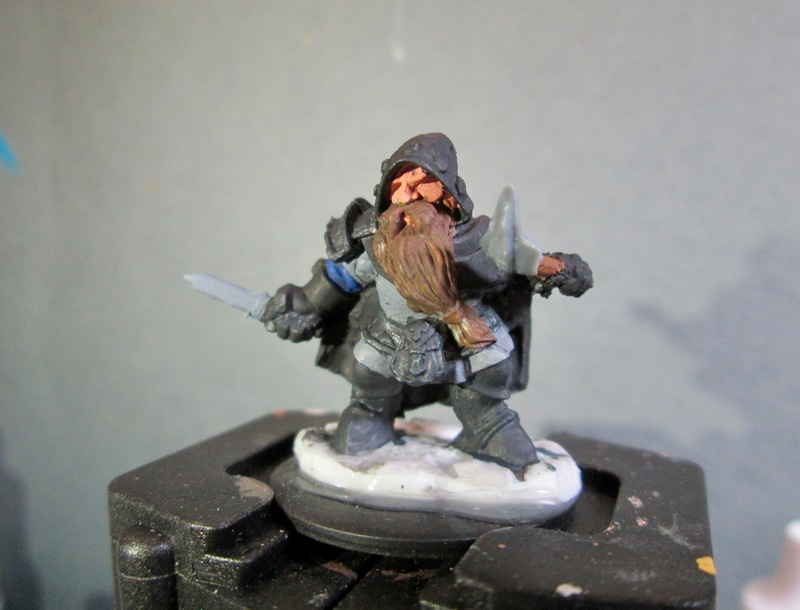 I then did the highlights on his beard, using the warmer Americana ‘Sable Brown on the right of the beard, and the cooler Americana “Mississippi Mud” on the left of the beard; again, to help with the OSL effect. At this point I realized I better actually get to painting the source of the light, so I began work on the flame. I started by painting the indented areas of the sculpted flame with Reaper MSP “Golden Glow”, then working up to the higher ridges of the sculpted flame, I progressed through Crafter’ Acrylic “Pure Pumpkin”, Reaper MSP"Holly Berry", and Reaper MSP Bones “Cinnamon Red”. Next, I finished highlighting the beard, giving some areas closest to the flame highlights with Folk Art “Butter Pecan”, and then some of the ‘Butter Pecan" with a little of the ‘Golden Glow" mixed in. 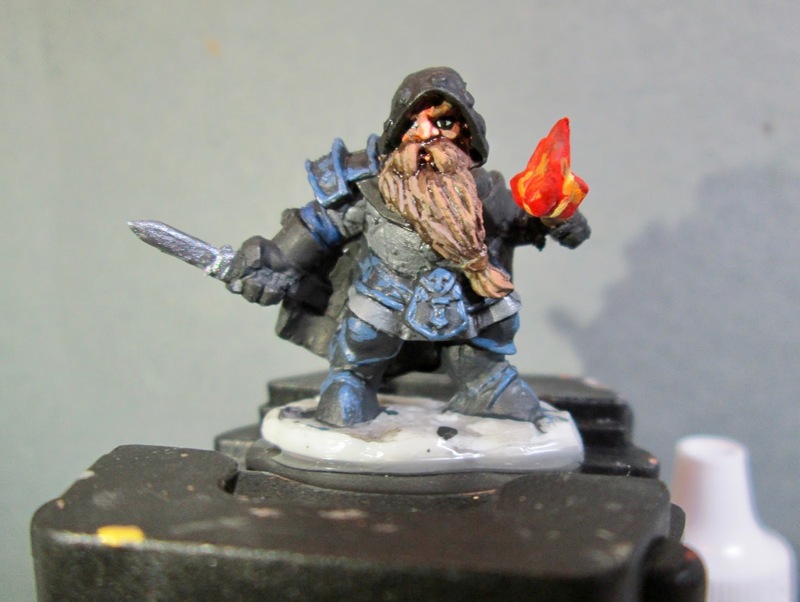 I then worked on highlighting his tunic with some Crafter’s Acrylic “Storm Cloud Grey”, and like the beard, I mixed a little of the “Golden Glow” in to do those areas where it looked like the flame would be most directly shining. After that, I worked on highlighting his cape, hood, and gloves with Americana “Neutral Grey”, and then, once again, I mixed a little of the “Golden Glow” in with the “Neutral Grey”, and highlighted the areas closes to the torch. At this point I highlighted his dagger with some Ceramcoat “Metallic Silver”, and then hit the very edge of the blade near the tip with some of the “Golden Glow” to (hopefully) make it look like the light was glinting off the edge. Lastly, I painted the figure’s base with Black. When the Black was dry, I used some white glue to glue a little black course sand onto the base. When this was dry I drybrushed the bases with some of the Americana “Neutral Grey”, and then some Duncan “Slate Grey”, and lastly some Folk Art “Platinum Grey”. I let the figure dry overnight and the next day I gave him a coat of Americana “DuraClear Matte” varnish. Another overnight dry, and I sprayed it with Testor’s Dullcote". I’m really pleased with how this guy turned out. I think the conversion worked really well, and it’s interesting to see how the brave Ranger changed into the sneaky Thief. I’m not happy with the OSL, but that takes work to perfect. I think it works on the beard and his left knee, but the hood and his left shoulder aren’t quite right. What a great conversion. 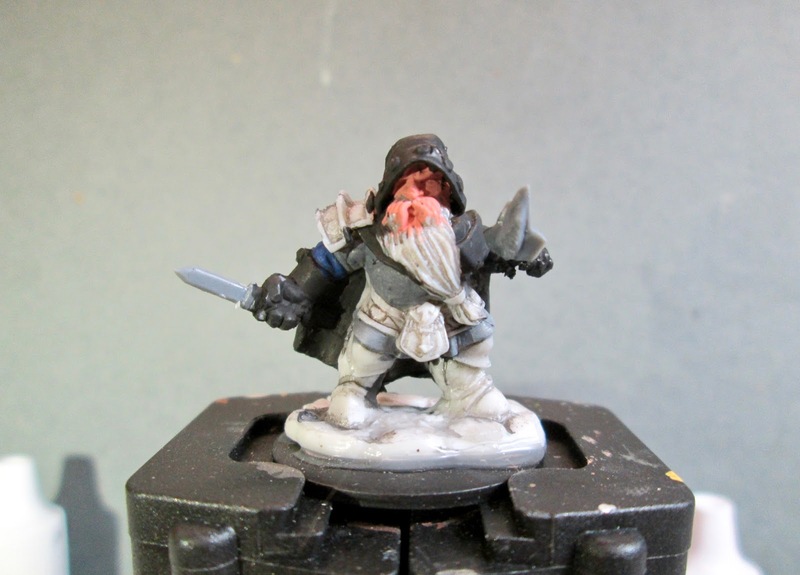 You don’t see too many Dwarves Thief models, and yours turned out really nicely. Great colors! Thanks! 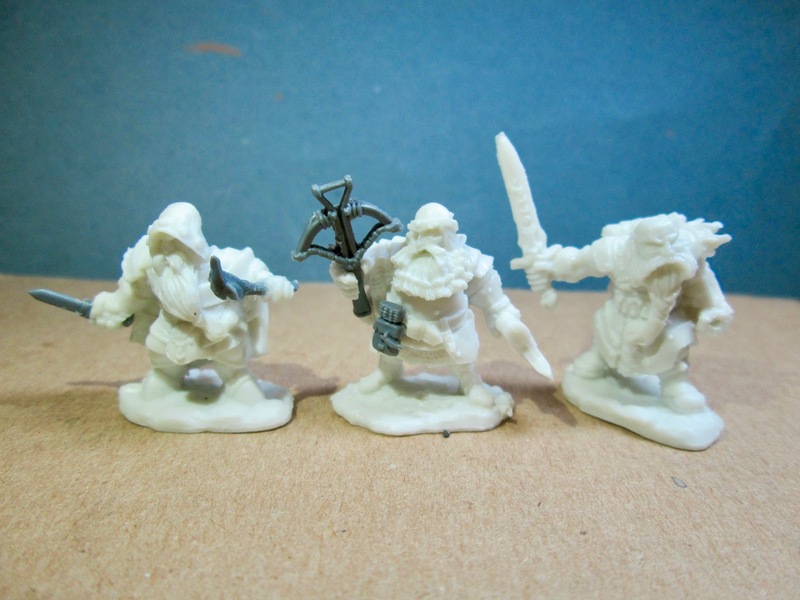 Yes, you’re right about the shortage of Dwarf Thieves, thats one of the things that inspired me to make the conversion. Pretty cool conversion Chris. I like the OSL really!